After our Christmas dinner spent with Cornelius’ family, C’s mom kindly wrapped up the turkey carcass for me to take home. Am I the only one who finds free turkey carcasses thrilling? The next day, I set about to make some homemade stock. First, I pulled off any remaining turkey from the bird and set it aside for later. Then I plopped the carcass into a stock pot and covered it up with water. I threw in some fresh thyme, peppercorns, bay leaves, a large onion, carrots, celery, hot pepper flakes and salt and set the whole shebag to boil. I then turned it down to a simmer and enjoyed the pleasant smells that filled the entire apartment for the rest of the afternoon, making me feel hungry and drowsy all at once. I strained the broth and then packed it up into lidded bowls and refrigerated them over night. The next day I set out to make Cornelius’ favorite soup. I set the broth to boil and added some chopped onion and carrots and the remaining turkey meat. Then I opened a package of Manischewitz’s matzo ball mix and followed the directions on the box. Maybe next time I’ll try to make them from scratch as it really doesn’t seem much more difficult than using a mix. Once they settled in the fridge for 15 minutes or so, I rolled them into balls and added them to the broth. Twenty minutes later, the balls had puffed up to fluffy gigantic deliciousness and we ate like kings. we covet carcasses too. last year we drove it home from NYC at thanksgiving and this year we roasted our own bird just to have our own! Yummy! 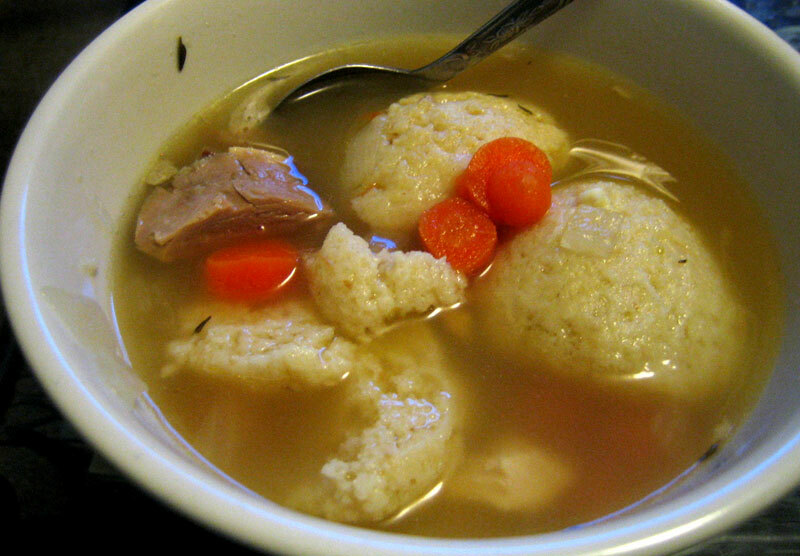 Just wanted to say hi (it’s my first time here) and offer you my family’s tried-and-true Matzoh Ball recipe, in case you’re interested. Rachel, nice to see another carcass-loving soul! Thanks for the recipe Beth! It looks wonderfully easy and I’ve added your blog to my blog roll! My sister and I fight over the carcass while my mother frets that she’s raised a pair of hyenas. Your blog is lovely, by the way. The illustrations on your header are particularly adorable. Tania, good to see there are some scavengers out there! Yes, the illustrations are so cute in my header and no, I can’t take credit for them. I found them in an old kids cookbook. So cute!